NEW BOX. NEW DESIGN BISOFT. STYLAGE M can instantly correct wrinkles. STYLAGE M is the first monophasic antioxidant cross-linked hyaluronic acid based gel sterile, completely biogradable, of non-animal origin. Cross-linked hyaluronic acid IPN 20 mg/g-Like + mannitol. 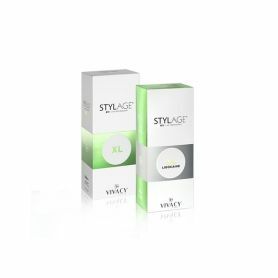 STYLAGE M is the first monophasic antioxidant cross-linked hyaluronic acid based gel sterile, completely biogradable, of non-animal origin specifically designed for the natural correction of superficial lines and wrinkles even the deepest of wrinkles away from around the mouth. Specifically designed for medium to deep wrinkles. The duration of the effect of a Stylage® M treatment is up to 12 months. STYLAGE®, Medical Device – Class III – CE Marking No. 0499. 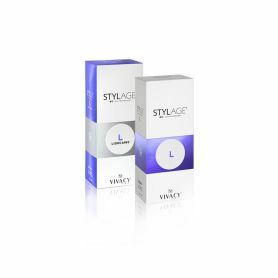 STYLAGE M is the first monophasic antioxidant cross-linked hyaluronic acid based gel sterile, completely biogradable, of non-animal origin, specifically designed for the natural correction of superficial lines and wrinkles. Correcting the worst of nasogenian folds. Treating superficial wrinkles and sagging chins folds to make them smooth and tight. Treating marionette lines around the lip corners. Eliminating nose hump and lifting the tip of the nasal. Shaping earlobe. Correction of the area around the eyes. Facial rejuvenation lifting loose skin and restoring skin firmness. Removal of the wrinkles around the mouth. 2 x 0,8 ml pre-filled glass, sterile latex free syringes. 4 sterile 30G½ single use needles. Inject between the middle and deep layer of the skin dermis, periorbital wrinkles (crow’s feet), glabellar frown lines (between the eyebrows), fine cheek wrinkles, perioral wrinkles (around the mouth), oral commissures (marionette lines) and dark circles (eye hollows) in the tear trough area under the eye. In 2019, VIVACY introduces Bi-SOFT®, a next-generation patented injection delivery system that reinvents the concept of a traditional syringe. The new device has a unique design and provides greater precision, comfort and control to the physician during injection of VIVACY’s dermal fillers. In its continuing quest for innovative excellence in medical aesthetics, VIVACY Laboratories, have developed a new- generation injection delivery system, Bi-SOFT®, to support physicians in their daily practice by providing them greater precision, comfort, and control during the injection of VIVACY’s dermal fillers. The new Bi-SOFT® syringes are ergonomically designed to be easy to use by young, as well as highly experienced users. The concave-shaped surface of the finger flange with the lifted edges helps avoid a lateral sliding of the doctor’s fingers from the gripping surface, and thereby secure the injection gesture. -STYLAGE® Lidocaïne "Special Comfort" Range: S, M, Special Lips, L and XL. 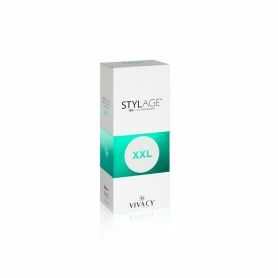 STYLAGE® Lidocaine is the only range of cross-linked hyaluronic acid dermal fillers which incorporates both a local anaesthetic (lidocaine 0,3%) and an antioxidant mannitol. This innovative formula has been developed to improve the patient’s comfort at the moment of the injection process and to facilitate the procedure for the practitioner. Delaying appearance of the skin ageing process.